Flowers are the perfect decor for any room in any home. They quickly dress up a space with a burst of color and convey a fresh feeling. However, not everyone has the green thumb (or time, energy or inclination) to keep flowers alive. That's where DIY paper flowers come into play. They don't require watering or sunshine, but they brighten up a room just the same. 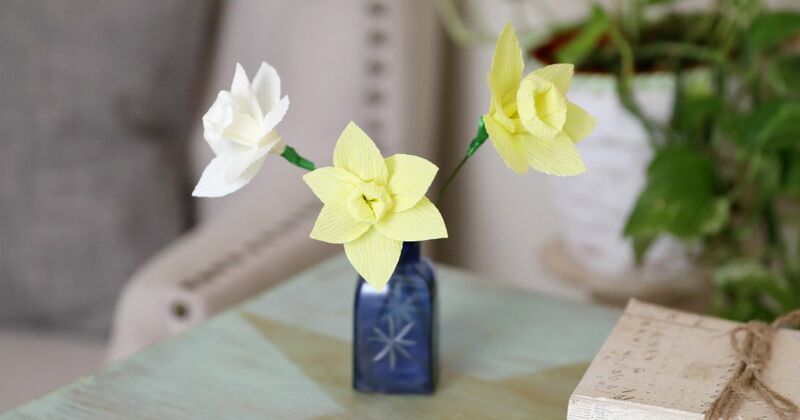 DIY paper flowers are a terrific craft for any season. They're easy to construct. In fact, some of these are simple enough for children to join in the making. Others are a bit more complex, making them fun for adults who want a crafty challenge. Once made, they're immediately ready for display. As you can see below, any cute vase or vessel can accent the finished flower. Change these flowers out with new designs any time you want to freshen up your decor. Bold red roses are perfect for adding romance to any room. Build these beauties out of construction paper. 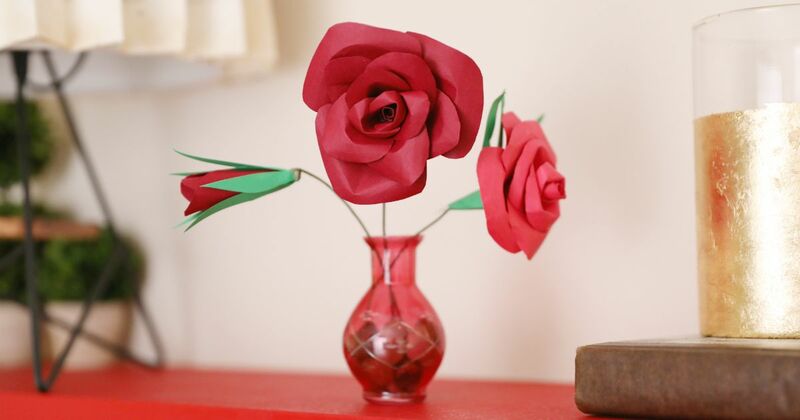 You'll be surprised to see how easy it is to grow a paper rose to any size you desire. 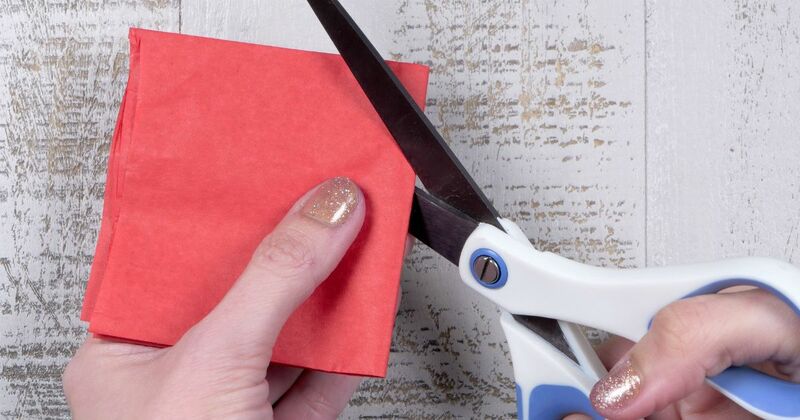 The video shows that you simply need to cut ovals out of red paper. 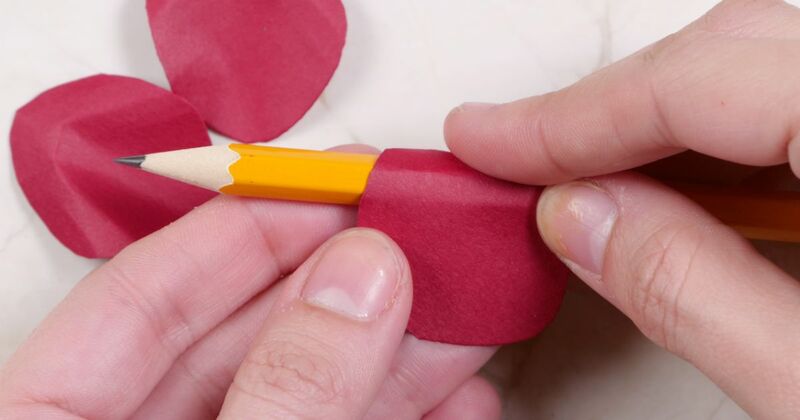 Then you use a simply rolling technique, wrapping the paper around the pencil to give each petal its shape. 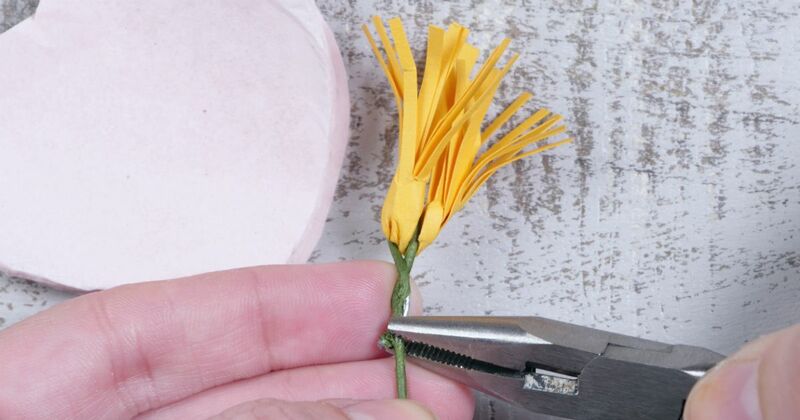 Next, using hot glue, you'll attach one petal around the next, enlarging the flower. It will give you a new appreciation for how layering can turn a simple project into one that looks much more elaborate. As a bonus, you can stop at any stage for a smaller, unopened flower, as we see in the photo above where the flower on the left remains a closed bud. The lightness of tissue paper gives these poppies a flirty, feminine feeling that makes them the perfect decor for all sorts of spaces. They'll add lightness to a serious space like a desk or enhance an already playful space like a living room. 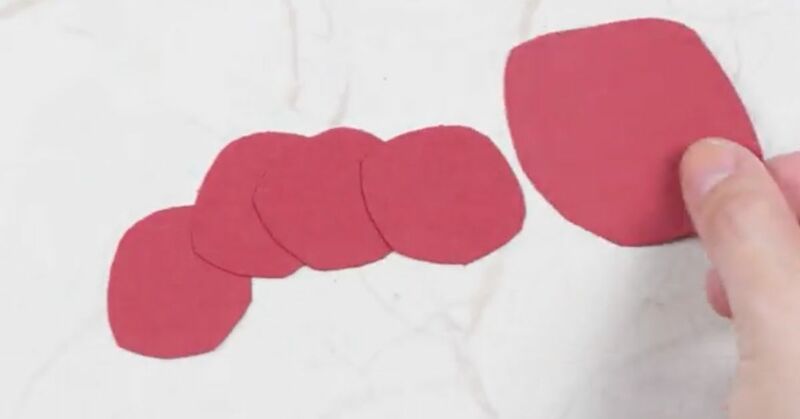 Use an easy folding technique to cut out the bow-like shape of the poppy petals from the red tissue paper. Then you'll learn an easy but unique fringe technique to create the poppies' center out of black construction paper, building up the layers of each flower around that bold middle piece. Add stems of varying heights to create a multi-tiered display in a large vase. Peonies have several symbolic meanings, the most common being prosperity and good luck. 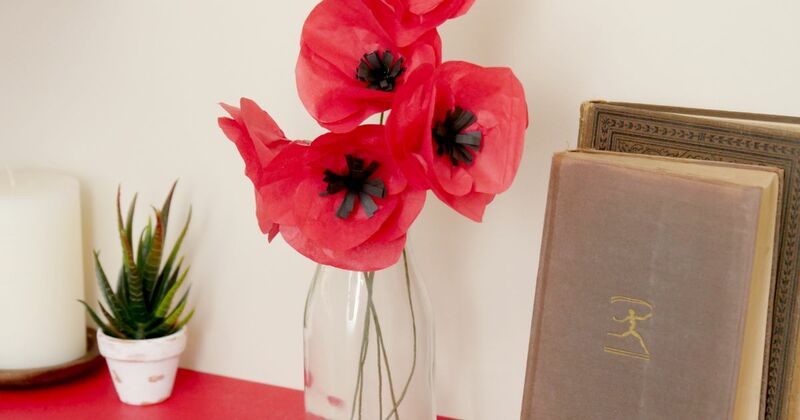 Therefore it adds positive energy when you display these DIY paper flowers in your home. They also make a beautiful housewarming gift. Incorporating fringe into the center of flowers is a popular technique that can be done several different ways. 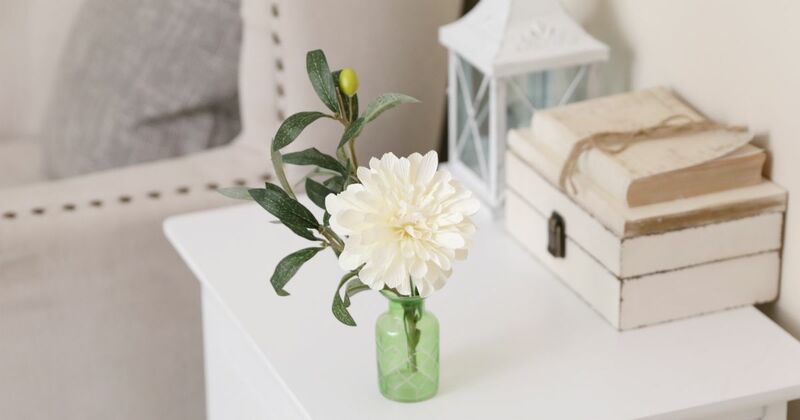 This video has a clear, step-by-step method that you can use to create these peonies as well as to come up with your own flower designs if you're feeling inspired. 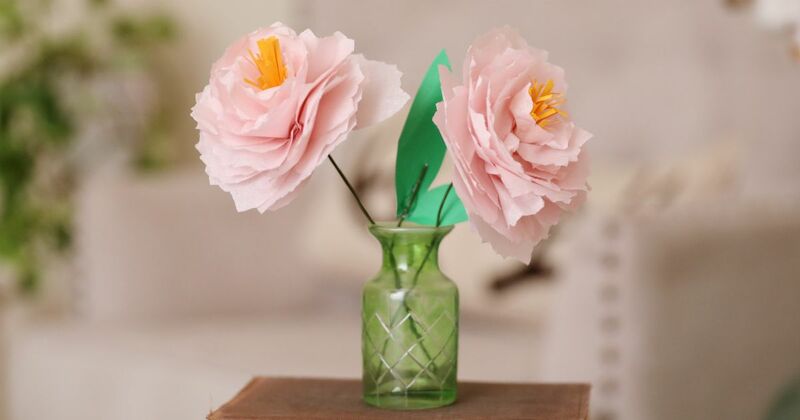 As you continue with the video, you'll see how adding a jagged edge to a cutout tissue paper petal will give you a more organic shape that makes these peonies look like they belong out in nature. Some people love red and pink flowers, but they aren't for everyone. White, on the other hand, adds fun to space without the bold color. These are perfect for a minimalist home or one that already has a lot of color in the decor. 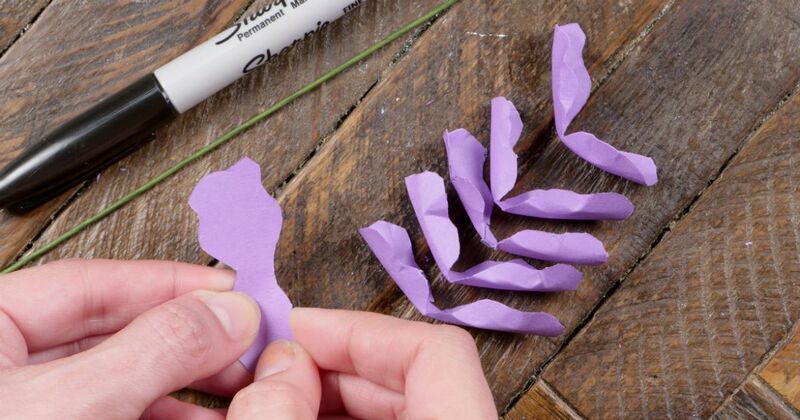 A few special things make this DIY paper flower unique, as you can see in the tutorial. First is the lovely textured paper used to create the flowers. Second is the fact that the flower petals are made by cutting out rectangles, rather than the oval shapes that other flower petals require. 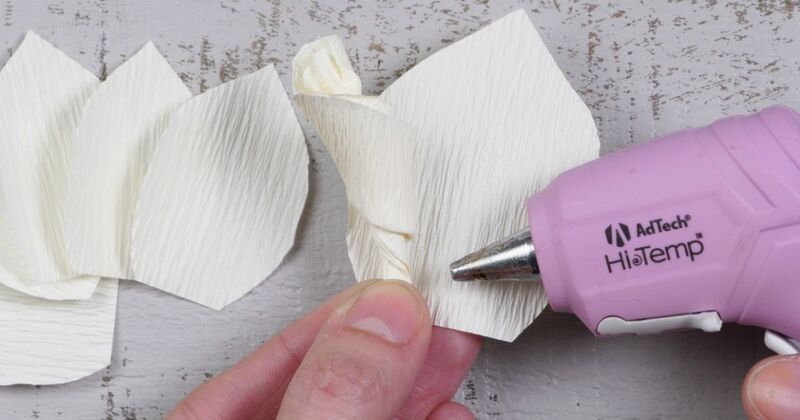 Plus, you'll glue all the petals to a Styrofoam ball, which differs significantly from the traditional wire stems in other DIY paper flower projects. Of course, some things are the same. For example, you'll learn how to use a new, one-edged fringe technique for the center of the flower. In the end, you'll end up with a huge, layered flower that pleases the eye as a single flower in a small vase. Each color of a tulip represents something different, so make sure to choose the right color for the message you want to convey. For example, yellow tulips are the most cheerful. 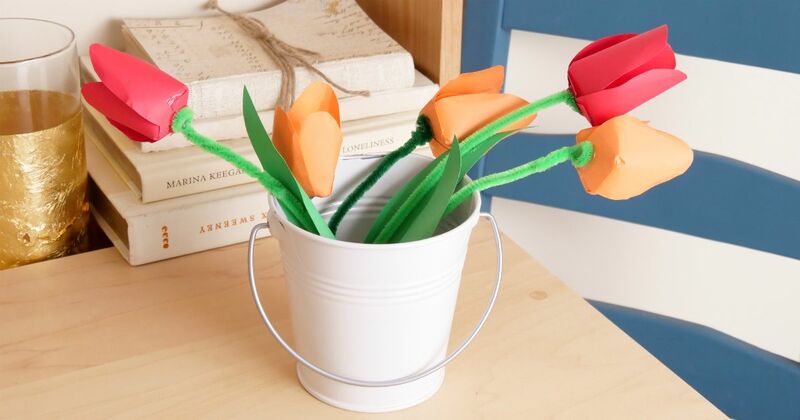 Tulips have the fewest petals out of any of these DIY paper flowers, so they work up really quickly. 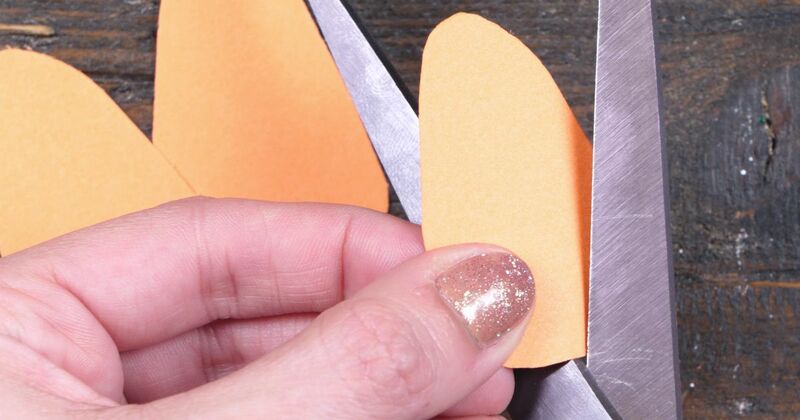 The video shows you exactly how to cut, fold and glue the base of each petal to give it that unique tulip shape. Once you've learned that, you're practically done with your first flower! 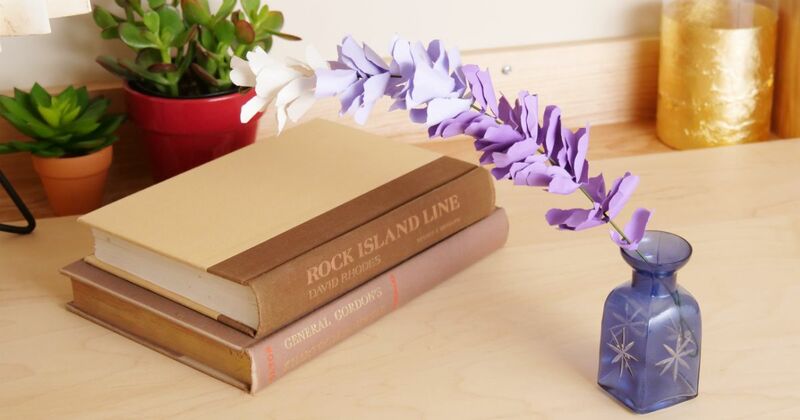 If you want to add some whimsy to your home then look no further than this paper wisteria DIY. There's a slight ombre from light to dark purple that makes this an on-trend choice. This flower looks a lot more complicated than the others. However, it's not difficult at all. The only real challenge is to get the shape of the petals right, which you can clearly see how to do in the video. Keep in mind that nothing in nature is perfect, and your work doesn't have to be either! The simple petals are added to a wire stem. Make the wisteria as short or as tall as you want to suit the vase you've chosen. 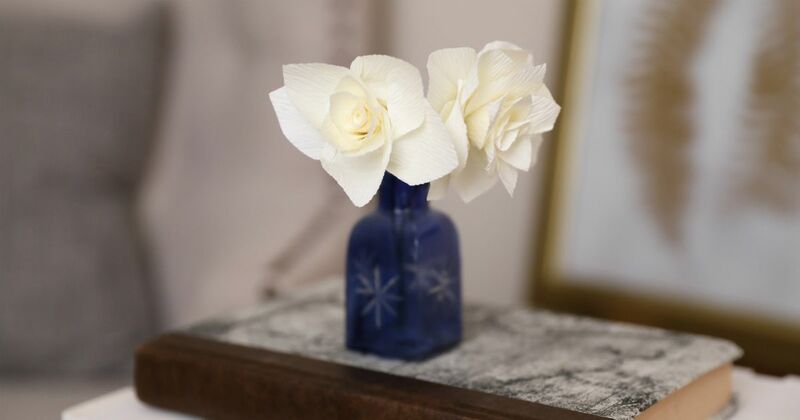 These paper flowers will add a dose of elegant beauty to any spot in the home. Don't limit yourself, though--paper gardenias are a top choice for DIY wedding bouquets as well. Use textured paper to get a crinkled look that makes these flowers look like they're alive. The petal shape is easy to make. 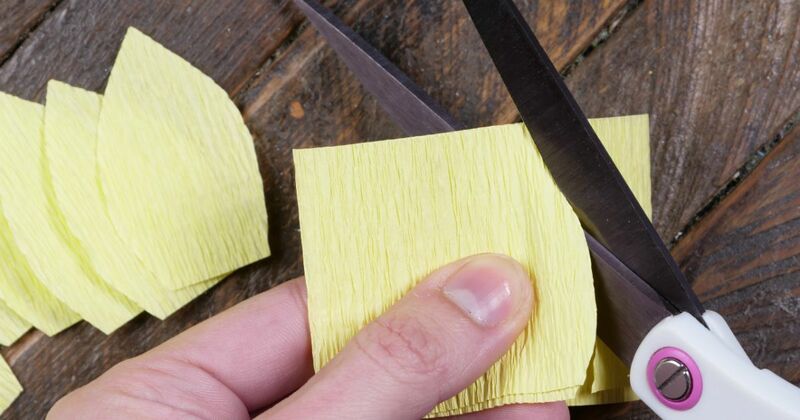 The trick is all in how you roll and glue each petal to the others. You'll see exactly how it's done in the tutorial video. Daffodils are bright and light, evoking happiness whenever you see them. Display them on a windowsill in the kitchen, the side of the bathtub or even in a baby's nursery. If you watch all of these videos, you'll discover that many steps are the same across the whole range of paper flowers. The details are what count: the precise shape of the petals, the exact placement of the folds and the way each petal is adhered to the others. With these daffodils, the unique part is the center, which easily sets this flower apart from the others. 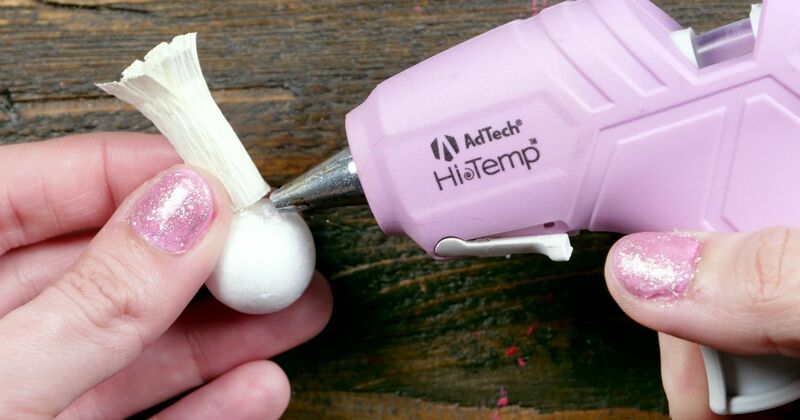 You'll learn it in the first part of the video tutorial, and the rest of the DIY project will be smooth sailing.